377 is an imprint on a pill which has been identified as tramadol hydrochloride 50 mg which is white in color and has elliptical/oval shape. Each pill has 377 on one side and the other side is blank and has a strength of 50 mg. The pill contains tramadol hydrochloride as an active ingredient and has a size of 13 mm. The active ingredient Tramadol is classified as a narcotic analgesic and is used for relieving moderate to severe pain. The pill is not recommended for long-term use because of the potential for abuse. It is manufactured by Sun Pharmaceutical Industries Inc.
Labeler / Supplier: Sun Pharmaceutical Industries Inc. The basic active ingredient in this pill is tramadol hydrochloride which is classified as a narcotic analgesic which is white in color, bitter in taste, has a crystalline structure and is an odorless powder. 377 pill contains tramadol hydrochloride as an active ingredient. Drug class: Tramadol is an organic compound belonging to the group of anisoles. These compounds contain a methoxybenzene. Tramadol hydrochloride is used for the treatment of moderate to severe pain. It is used for the treatment of back pain, chronic pain and since this is an opioid analgesic so is used for the management of severe pain in which other alternatives are not adequate. It is also for treatment of anxiety and depression. However, these tablets are contraindicated, in children below 12 years of age, for post-operative management in children below 18 years of age following tonsillectomy and/or adenoidectomy, and also in patients with significant respiratory depression, acute or severe bronchial asthma, known or suspected gastrointestinal obstruction, those individuals who are concurrently using monoamine oxidase inhibitors or those who are allergic to tramadol or any component of this product. Tramadol hydrochloride 50mg is classified as Schedule 4 controlled substance under the Controlled Substances Act of 1970. The drugs in this category have a low potential for abuse. Currently, this drug has been accepted for medical use in the US. This drug may cause limited physical and physiological dependence if abused. What are the different brand names of Tramadol hydrochloride? Tramadol is generally an inexpensive drug. The drug is generally covered by most Medicare and insurance plans and for the betterment of patients some pharmacies offer coupons and even cash prices which are even lower in price. One such retailer is GoodRx, which is an online pharmacy where the most common version of tramadol has a price of around $8.48 which is by far the lowest price and is 87% less than the average retail price of $69.24. Tramadol hydrochloride tablets contain tramadol which is an opioid agonist and also inhibitor of norepinephrine and serotonin reuptake. The analgesic activity of tramadol is thought to be particularly due to the binding of μ-opioid receptor which causes a decrease in the transmission of nerve signal which carries pain sensation and also due to inhibition of serotonin and norepinephrine reuptake. Can 377 pill cause dependence? Tramadol is an opioid so upon chronic therapy, both tolerance and dependence can develop. Tolerance can be developed to the desired and undesired effects of the drug and develops at a different rate with respect to each effect. Physical dependence usually results in withdrawal symptoms which occur if the drug is discontinued abruptly or if dose reduction is significant enough to cause these symptoms. Symptoms include irritability, anxiety, joint pain, insomnia, nausea, vomiting, diarrhea etc. These symptoms usually occur after using the drug for several weeks. So, this drug should not be discontinued abruptly to avoid the withdrawal symptoms and the dose should be reduced gradually with time. Infants which are born to physically dependent mothers are also dependent and show respiratory difficulties and other warning signs. Absorption and Distribution: Tramadol HCL is absorbed well after oral dose and the mean absolute bioavailability after a 100mg of oral dose is 75%. Absorption is not affected by the presence of food. Volume of distribution is 2.6 L/kg (in males) to 2.9 L/kg (in females) followed by 100 mg of Intravenous dose. Plasma protein binding is approximately 20%. Metabolism and Excretion: after oral administration, it is extensively metabolized by cytochrome CYP2D6 and CYP3A4 pathways, and also by conjugation of the parent compound and the metabolites. The major metabolic pathway appears to be N– and O-demethylation and glucuronidation or sulfation in the liver. One metabolite (O-desmethyltramadol) is pharmacologically active. Tramadol metabolites are excreted primarily by the kidneys. Approximately 30% of the dose is excreted unchanged in urine whereas 60% of the dose is excreted as metabolites. How long 377 pill stays in the system? The elimination half-life of tramadol and its active metabolite is approximately 6-7 hours. 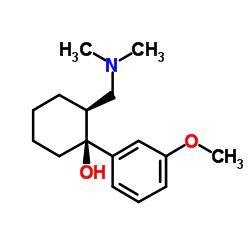 Tramadol has a half-life of about 6.3 ± 1.4 hours and the active metabolite has a half-life of about 7.4 ± 1.4 hours. This implies that it can take about one and a half day for the drug to be completely removed from the body.